"Diamonds are a girl's best friend," according to Marilyn Monroe in the 1953 film "Gentlemen Prefer Blondes". Indeed, diamonds have always fascinated us. This crystal orb is embedded with 13 cubic zirconias. 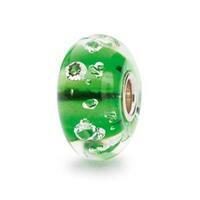 The bead is lined with emerald green.